Don’t Mess With Me !!! It is amazing how a little break recharges the mind and body. I felt totally spent after the crossing of Tampa Bay but after the break I was feeling pretty good. The wind was still blowing but I was making progress and in this particular area there were lots of structures to act as a wind break. As I made my way down Anna Maria Sound I saw another Watertriber who goes by the name of CWolf about a quarter of a mile ahead of me. 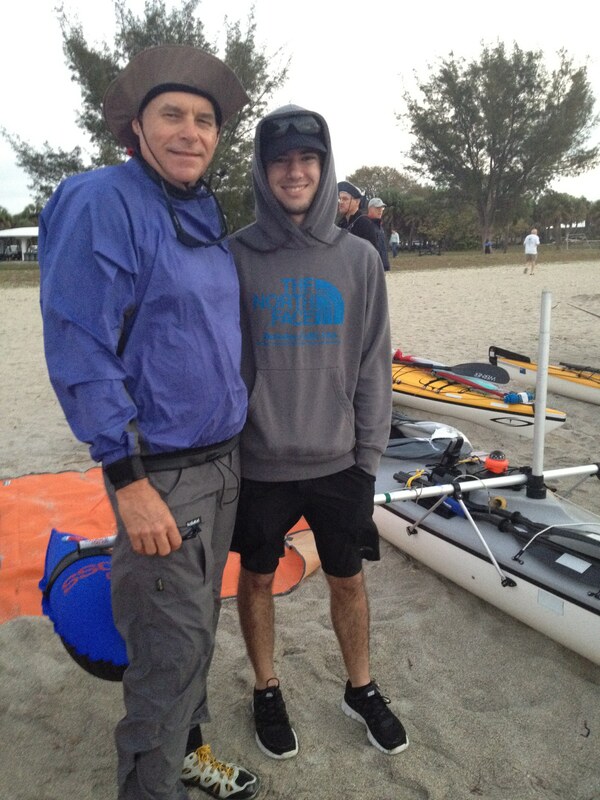 CWolf and I had paddled together during last year’s EC across Florida Bay. We had the unpleasant experience of getting hit by a front that had winds up to 50 mph in it. I really enjoyed paddling with him last year so I started to increase my speed to catch him. There are probably as many strategies in paddling one of these events as boats. I had decided that for today I was going to follow a course which would give me as much protection as possible from the wind even if it was not the shortest or most direct course. As I exited Anna Maria Sound, I noticed that CWolf was on a different course heading than myself. He was going for the shorter route but in the teeth of the wind. I was on a course which would follow the western shoreline of Sarasota Bay. Another lesson I have learned in these events is to never turn down a tip from a local. Well, as I was clearing Sister Keys, a rower in an open water rowing shell came up to me. I was shocked that he was out in these conditions and how fast he was going. He was a very personable guy and he told me about a canal that was well protected and followed the edge of the Sarasota Bay. Hey, at this point in the day I am all ears for a tip that gets me out of the wind. So I started heading for the location he told me about. As I got closer I realized I wasn’t the only one heading for this canal. There were four kayakers just ahead of me and I knew they had to be Watertribers. No one else would be out in these conditions! In any event, they sure made it easier for me because all I had to do was keep them in sight and follow them. The canal did provide some nice protection and as I was making my way through it I came across a veteran Watertriber who had beached at a marina that was just off the canal. This particular Watertriber is a veteran of multiple Watertribe events, is a class winner in an EC, and is known for being extremely tough. So I was surprised to see this individual beached. Since I was running low on water I decided to also beach at the marina and get some water. This beaching was the first sign that I had somehow left what grace I had at FT Desoto and had become the King of Klutz. As I got out of the boat I slipped on a rock, fell into the water, and took a chunk of skin out of the side of my knee. Great, just what I needed! An open wound in a wet boat on the first day of the challenge. Open wounds in a boat when you are doing a multi day event is not a good thing. Trying to keep them dry to heal is a challenge and then there is the fight to keep them from getting infected. Needless to say, I was able to get it to heal, but today I have a scar to remind me of it. After getting myself composed and my boat secured I went to talk to the veteran who was not feeling well at all. The veteran had decided to call it a day and was going to get some sleep and see how they felt in the morning. I felt sad for them but knowing how tough this particular individual is I didn’t want any part of what was making them feel bad. I got my water bottles filled up and pushed off (without falling all over myself–but I would reserve that for the future). As I paddled away I prayed that this vet would feel better in the morning and could finish their challenge. The rest of the evening and into the night I kept paddling ever so slowly towards the end of Sarasota Bay. It was an emotional uplift to paddle under the big bridge to Bird Key marking the end of Sarasota Bay but it was dark and the wind was still blowing. Do I keep going and fight the wind or do I call it a day and get some sleep to fight another day? Oh and there is the deadline to get into CP1. I decided to keep pushing ahead. Two hours later I was in Roberts Bay and paddling right next to a nice looking island that had camp site potential. Finding a campsite in the dark from the water is a real trick and you can waste a lot time searching for one. So when you find a good one you better take it. The winds were still out of the south which would mean I would want to camp on the south side of any island so I would have the winds to keep any bugs off me. As I started to get to the south side of the island low and behold the mangroves parted and there was a nice sand beach. Hey, maybe God is trying to tell me to get some sleep. I decided I had had enough for the day, paddled for the island and pulled the boat up on the beach. As I got out I noticed a signed that welcomed me to the island but also stated “NO CAMPING ALLOWED”. Hmmmm, it is late at night, the winds are howling, there is rain in the air, I will be gone before daylight and I am tired. I AM CAMPING! So I started to unload my gear and that is when I noticed a flickering light and realized I wasn’t the only one on this island. Shoot!!!! It is not a Watertriber. They would never take the time to build a fire unless they were having hypothermia problems. What do I do now? As I thought about I decided I would rather find out now if it is someone who is going to run me off the island versus after I get my tent setup. So I started to make my way through the woods towards the flickering light. I am sad to say that I am probably responsible for scarring three teenager boys who live in the Sarasota area for the rest of their lives. I mean they were just sitting by their fire, minding their own business, listening to the wind howling, and doing what three teenage boys do in the woods (I will leave that to your imagination but I don’t think it was legal). 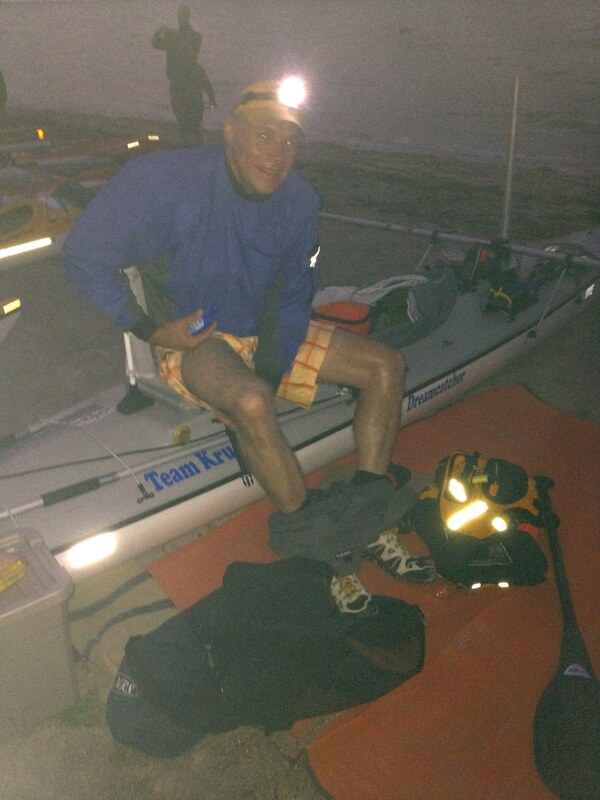 Then this kayaker, dressed in all his gear, and with a look that could kill, comes busting into their camp site. All I heard was screaming, a bunch of low crawling and words like %@%$&, *&%@&, %#@%&. After a very brief and pleasant discussion, I was pleased to find out they didn’t mind at all if I camped on the island since they were camping also and they assured me that they wouldn’t bother me at all. It is so nice when we can all get along. I know that there were three of them, but I was in no mood to be messed with and I think I made that clear — and I didn’t even have to use my Parang either. I think I got my tent setup in record time, got a meal in me, some dry clothes on and called Lisa. The winds were increasing in strength and Lisa said it was supposed to storm all night with winds staying out of the south. Glad I checked for widow makers (tree limbs that can fall on you) and that I have a good tent. Sleep came fast………….. I just can’t do it. I can’t just sit here reading these post-challenge posts and NOT chime in. I mean, after all, I am already here EDITING, right?!? And if I am going to be editing, I might as well clarify some of the facts too. As for the drive to the start of the challenge… Me quiet? Me worried? Three words… SMALL CRAFT ADVISORY!!!! Chief himself, as well as the Race Director, were in fact walking up and down the beach at 7:00am announcing, “The race has officially started, it is your choice to launch now or wait.” REALLY?!?!?!? As for the comedians in the family, I don’t know where they get it from? LOL! But come on, admit it, you know you thought the same thing when you saw the picture. I am not going to make it to CP1 !!!! Even though the wind was blowing pretty hard, the waves at the start were not that big. 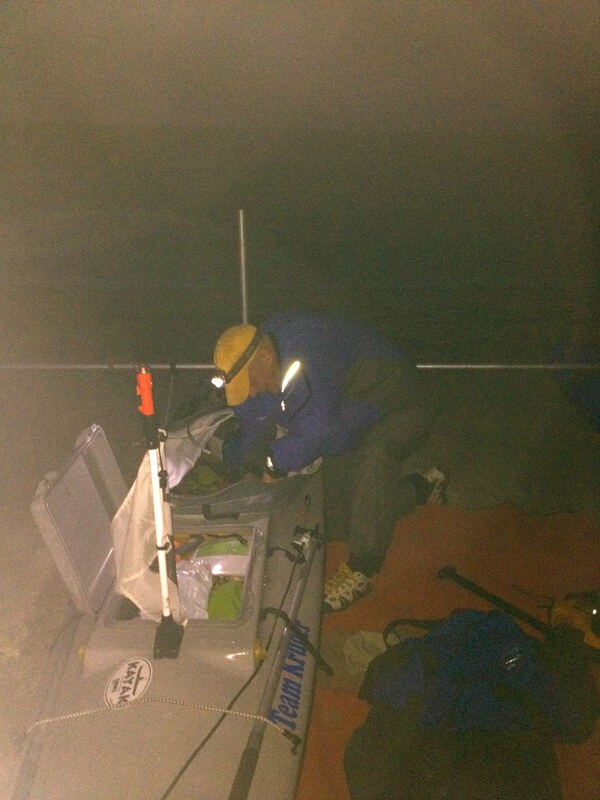 Initially, it wasn’t bad paddling and I was making pretty good progress but that was short-lived. As I got into deeper water the waves grew and as time passed I really think the winds just got stronger. In the past it has taken me anywhere from an hour & 15 minutes to an hour & 30 minutes to cross Tampa Bay. Not so this year. In fact, at an hour & 30 minutes I was not even half way across. I was paddling hard and with my amas out I was really digging into the stroke but it felt like I was not making any forward progress. This type of paddling can be real depressing and can work on your mind if you let it. I guess I was about three-quarters of the way across the bay when a couple of negative thoughts hit me. First, I felt I was not going to be able to overcome this wind and I will be pushed all the way back to Ft DeSoto. My second thought was I may not be able to complete the UFC. I am a big believer that positive self talk and positive visualization is key for superior performance. If you let a negative thought enter your mind you are programing yourself for that outcome. If you only think positive thoughts, there is no guarantee that positive outcome will occur but it sure increases the odds. Well, having that negative thought really pissed me off and thoughts of, “I WILL BE #$*@#&% IF THAT IS GOING TO HAPPEN” and “IF I HAVE TO PADDLE UNTIL I DROP TO GET ACROSS THIS BAY I WILL !!!! entered my mind. Now one thing I have learned is that you have to be careful with emotions in critical situations. They can be beneficial but generally it is good to make them short-lived because they will get in the way of the real solution thinking. I was angry at myself for thinking negative thoughts and angry at the wind, but I needed to stow this anger so I could think. 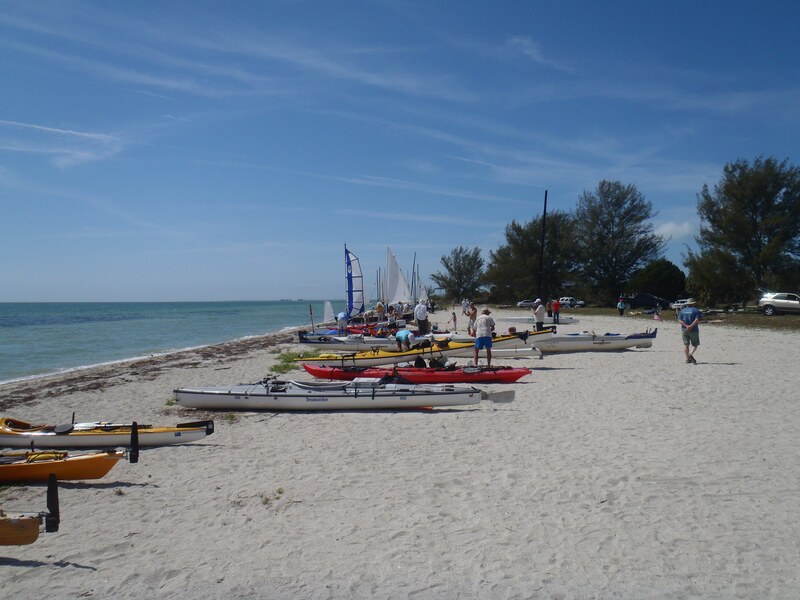 I had been paddling my plotted course which had me and all the other brave souls who had launched heading to Anna Maria Island. This is the shortest route over good water depth but at the same time it kept me exposed to the winds and big waves. I could angle over to the land mass just west of the Manatee River which would provide some protection from the wind. This course was longer in distance and would expose me to some risk of shallow water that I may not be able to paddle over. No one else was doing this but hey, I am not a banana so I don’t have to be one of the bunch. I changed course. At first, it seemed like I was going nowhere but slowly it got easier and easier and the waves got smaller and smaller. I made it but was I exhausted. I was in calm water and I found there was enough water for me to paddle the shoreline. As I got to the Perico island which is part of the entrance to Anna Maria Sound, I saw several Watertribers resting on a small spoil island just off of Perico Island. They had also made it across and were stopping to recover. 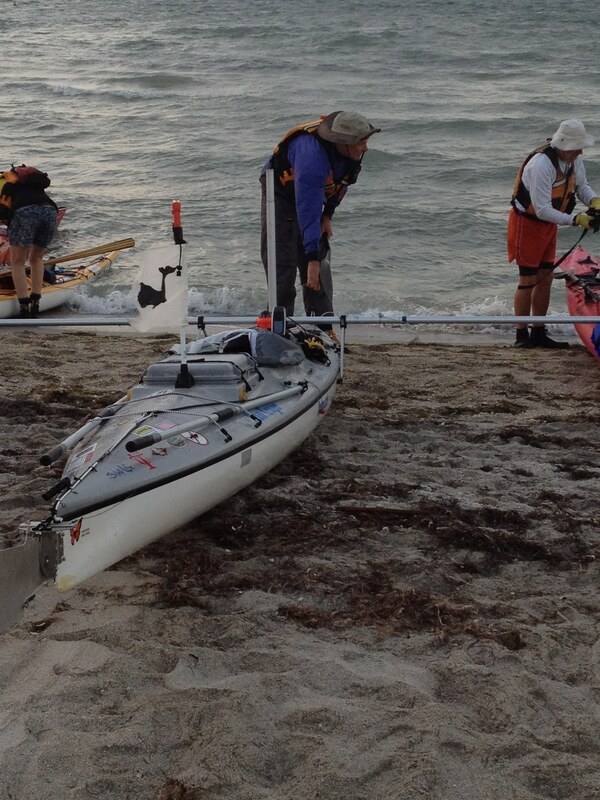 Who would have ever thought that this island would have a visit from a Watertriber during an Everglades Challenge race. Normally everyone is cranking through this area with the thought of maybe stopping for a short break in Venice (35 miles away) or not stopping at all until CP1. Not this year. About this time a small beach appeared and I decided in this case it might not be a bad idea to be a banana. I stopped to get out and stretch my muscles, get some fuel in me, and ponder my next move. The winds were not shifting to the SW as I had hoped and in fact seemed to be blowing S/SE. No sailing for me!! I also started to ponder the thought that if I could not increase my speed there were not enough hours in the day for me to make it to CP1 today. I have never not made it to CP1 the first day of the race and to complete the UFC in the allocated time I needed to cover 40 miles a day. Ok, that just means I will need to paddle longer one of the upcoming days. I can do it. I have in the past paddled 60 miles in a day. Now that is the way to be thinking! 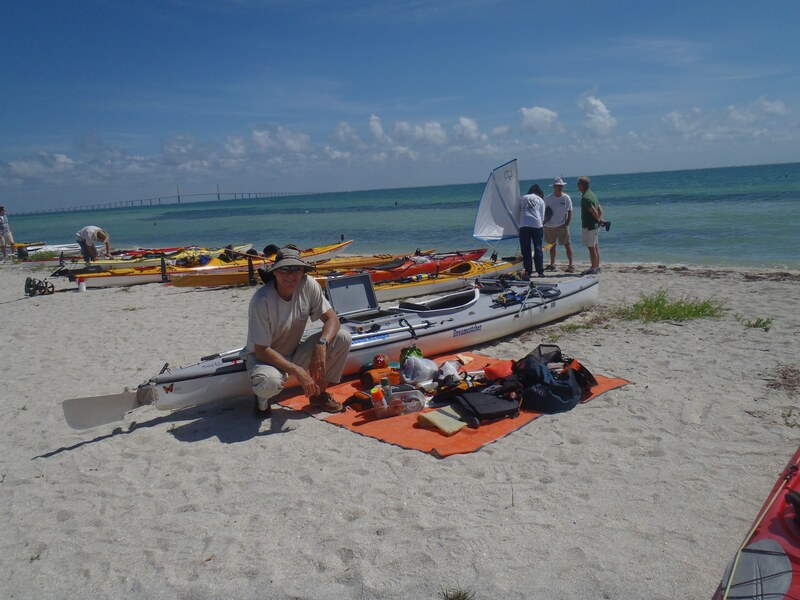 Sitting on the beach wasn’t getting me any closer so I got back into my trusty Kruger and started heading to Sarasota Bay……. This is a video by Danito, who was in a Kruger Sea Wind. I am impressed that he could free his hands up to shoot a video. Sixteen days have now passed since I finished the 2012 Ultimate Florida Challenge. I no longer sleep paddle. Lisa no longer leaves the bathroom light on to remind me that I am not in the woods and that we do have a bathroom. (I guess am house broken now.) I no longer wake up every two hours and I am not dreaming about some upcoming paddle segment or about a plate full of hamburgers. My energy level is coming back and I have actually started working out again. No heavy-duty workouts but they are workouts which is progress. I still do have some numbness in my fingers but they are getting better each day. I can type and feel the computer mouse. Which means I really cannot use my numb fingers as an excuse for spelling errors. So over all I feel pretty good about where I am at and feel I am really lucky not to have more issues mentally and physically. People have talked about a slump or depression folks enter after complete something like the UFC. So far I have not experience that. I think it was the third day after I finished that my wife asked me “Ok what is the next crazy thing you are going to do? ” The spooky thing about my wife is that I think she can read my mind because I was already mentally thinking about a new challenge. My reasoning and excuse for thinking about a new challenge is that by focusing my energies on to a new challenge will help me avoid the slump or depression folks talk about. Sounds logical to me. Her response ” I love you, glad you are my husband but you are not right !” So next week will be the first week of training for the next challenge which also means I better start writing about the experiences and events of the UFC before I forget them. So here goes………… I have often heard that half the battle of a Watertribe Challenge is getting to the start line. There is a lot of truth in that statement and the Friday before the start really reveals the different levels of readiness folks are at. I like to show up early on this day so I am not rushed and I can take my time getting ready. Plus folks walking down the beach always want to stop, talk and ask questions. I don’t want to be rude or not have the time to talk to them. This year I decided to have some fun with folks. A couple of special people had given me some things prior to the event but this one was the most hilarious. 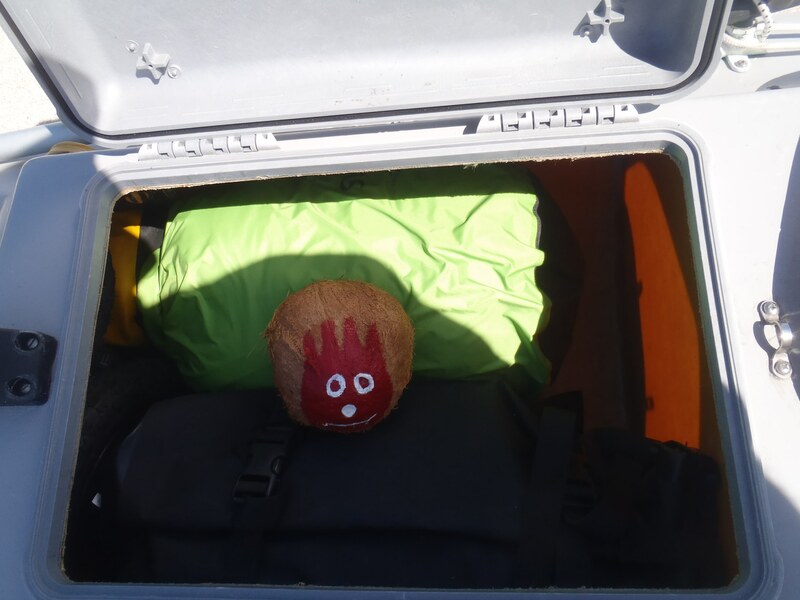 He was my “Wilson” I took him every where on Friday and people would crack up when they saw him. I put him in the boat when I was packing. Set him on top of the boat when I was finished. Even took him to check in table and then in the seat next to me waiting for the Captain’s meeting. It added a little humor to the stress of the day. 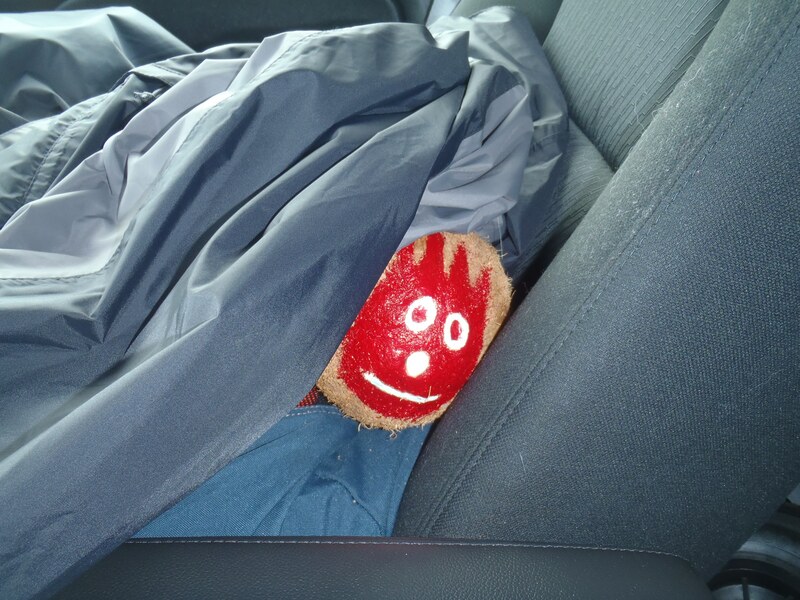 People said I should take him with me so when I needed some humor he was there. I didn’t take him for two reasons. (1) things like this you value and I didn’t want him to get messed up and (2) I was afraid I might actually start talking to him like he was a real person. It is interesting watching folks getting their boats ready. For some it is like clockwork. They know where everything goes. They pack their boats fairly quickly and are very relaxed. 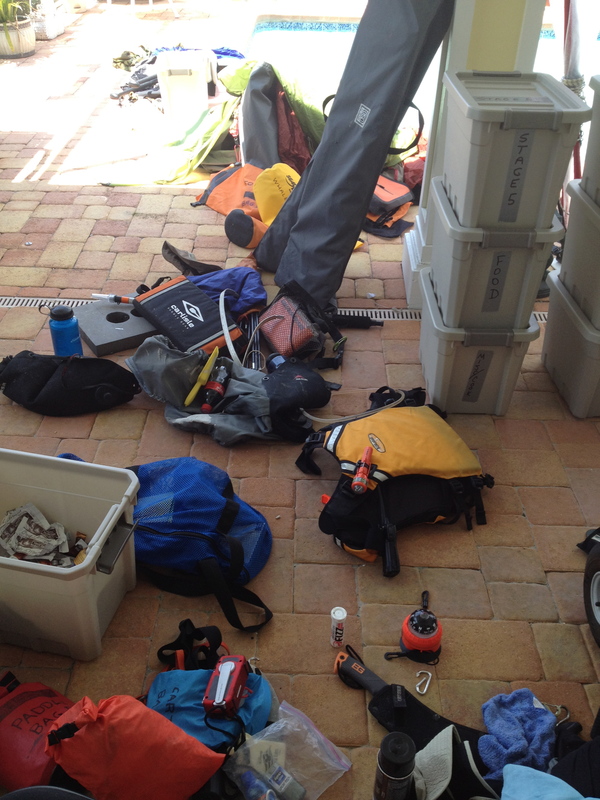 Then there are others that you would think Friday was the first time that they have packed their boats with an expedition load. When I see that I wonder if they really understand what they are about to face. More on this in my next post…. The wait is over. Thanks to Chief for getting this up for everyone’s viewing pleasure. Well it has been about 48 hours since arriving at my destination of Ft. DeSoto. I was feeling such exhilaration for finishing, and my energy level was strong, but it didn’t take long for my brain to recognize and tell my body, you are done. My body felt like it was shutting down. I have been surprised at the exhaustion and fatigue and the general feeling of being in a fog. Sleep has not come easy and the pain in my right hand has been extremely intense. My right hand is the worst as I have lost the feeling in my ring and middle finger. As those nerves have started to heal, it has been painful. With each hour it seems my body is getting used to being back home and that is a nice feeling. I wanted to take a minute to say thank you to everyone. Thank you for the prayers and the thoughts and the support that was provided to both me and Lisa during this time. There is no doubt during some of this journey divine intervention was taking place, and I know that was because of the prayers. I also want to say thank you so much to the folks that were there at Ft. DeSoto to welcome us home. I know for some of you this meant taking time off from work and traveling long distances. The red carpet, the balloons, the whistles, the very gentle handshakes, and the fellow Watertribers (some of which have done this before me). It is very hard to put in words how much it meant having you all there. I plan to capture, in future posts, some of the stories and experiences of the race, so keep checking back. Also, here is a link to a video taken at the finish – Thanks Marty!! Enjoy! !